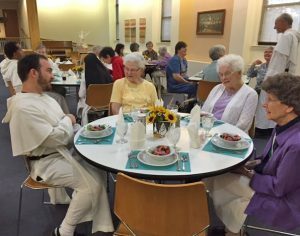 GREAT BEND, KS – The Motherhouse in Great Bend had its own personal and very wonderful celebration for the 800th anniversary of the Dominican Family’s founding. The Dominican men from the Central Province Novitiate in Denver and their Director, Fr. Bob Keller, spent some fun and relaxing time with nearly 50 Great Bend area Dominican Sisters of Peace and Associates. The novices were on their way back home from their 4000+ miles of travel to Dominican sites east of Kansas. They told us what a great experience it was to meet priests, nuns, and sisters of the Family as well as to visit many of the parishes and institutions staffed by Dominicans.